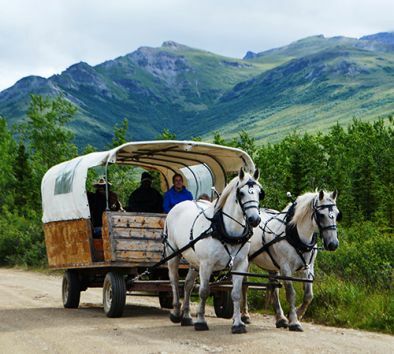 Travel back in time during this splendid journey across Alaskan tundra on a horse-drawn covered wagon reminiscent of those used by pioneers while you explore the great Alaskan wilderness. The tour begins at a tranquil lake offering awe-inspiring views of Alaska’s mountainous skyline. Climb aboard the roomy covered wagon and settle in as two beautiful draft horses lead the way through the tree-laden countryside. While soaking up breathtaking views of snow-capped mountains reflecting the sun, listen as your guide unveils this mining area’s rich history. As you continue on the trail, discover a primitive cabin abandoned by an Alaskan old-timer and arrive near the Dry Creek riverbed home to Athabascan Indian artifacts. Breathe in the crisp air while watching for wildlife. Arrive at a rustic pavilion with unbelievable views to savor a freshly prepared family-style gourmet feast. After dining, greet and meet your horse team for a great photo or just a chance to pet your horse. This excursion is a relaxing opportunity to see and smell the great land of Alaska and is great for the entire family! Bring a warm jacket, hat, gloves and a camera. Dress in warm layers. Blankets are provided. Wildlife sightings are likely but not guaranteed. Wagon ride & backcountry dining portion is approximately 2½ hours.